Greg Packer, we salute you. 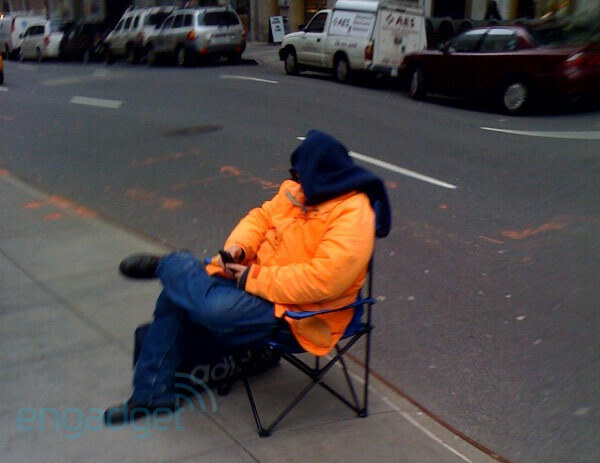 Sure, the weather in New York City is a lot finer now than it was back in the sweltering summer of 2007, but we still feel the need to tip our hat to someone who'd camp out three whole days at Apple's Fifth Avenue store (read: "The Cube") for an iPad. Tipster Tom dropped in the image after the break at around 3:15PM ET yesterday, and after a short nap in Penn Station, Mr. Packer is freshened up and holding down his spot yet again. We aren't anticipating iPhone-esque lines this coming Saturday, but considering that new pre-orders aren't being fulfilled until April 12th or later, we reckon this guy is following that whole "better safe than sorry" thing to a T. Check out a brief video captured on the streets (thanks, Zoltan Kaprinay!) by tapping that 'Read More' link, and head on over to Switched if you'd like to relive a similar interview from the iPhone campout. Question: "So, nobody took your place?" Question: "So, you are the first one?" Packer: "So far, yep yep!" Question: "So you're going to be the first one to buy one, also?" Question: "Do you have any number?" Packer: "Huh?! Yes, yes. Well, first come, first serve! They don't give you a number, you queue up for a number." Question: "Do you have something in your bag, to eat or drink?" Packer: "Just mainly a change of clothes. Nothing to eat, nothing to drink." Question: "Why do you want [the iPad] so desperately?" Packer: "Because... it's like a mini laptop! I mean, you just... you know, click it on, just like you click the iPhone on. And you don't have to open it up, and you know, go through, you know, go through everything. " Question: "So, you need to have it?"